When Gwendolyn of Wine Predator challenged the French Winophiles to explore and pair biodynamic wines this month, I almost didn't participate. It's not that I didn't want to learn about biodynamic practices and try some of the wines; I was completely intrigued by her invitation post which you can read here. But the boys have launched into build season for robotics and given that they are both on the team and Jake is the team mentor, it's become a family affair and my free time is also completely dominated by supporting this venture. Still, I figured I would stop by one of my favorite shops, on the way home from work one night, and if they had some French biodynamic wines, I would join in the fun and games. Lo and behold, Renee not only had some, but she knew a lot about them. She talked about burying a cow's horn and planting by the light of the full moon. But really, she was just underscoring the fact that biodynamic winemakers have a more spiritual approach to their craft. However, I do think there is something to that horn thing. I need to do more reading. In any case, I picked up two bottles of M.Chapoutier wines - one red and one white - and decided to forego my usual task of finding recipes typical of the area in which the wines were made. Cross-culture food pairings were it this week! 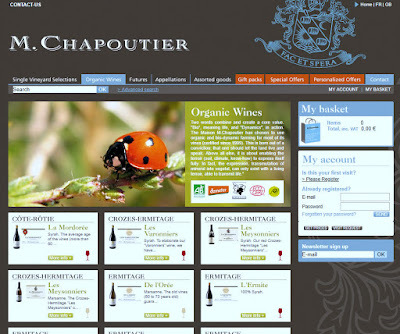 A quick note: when I sent my title to our host, Gwen pointed out that not all M.Chapoutier wines are actually biodynamic. I did more digging on their website and realized, in dismay, that the two I had just bought and paired were not. Well, crap! Really, I needed to do more reading about biodynamic wines and winemakers. But time was of the essence and an actual biodynamic wine that I had ordered wouldn't be here till after this event. So, I'm running with these non-biodynamically certified wines and just pointing out my error to you readers. Apologies. 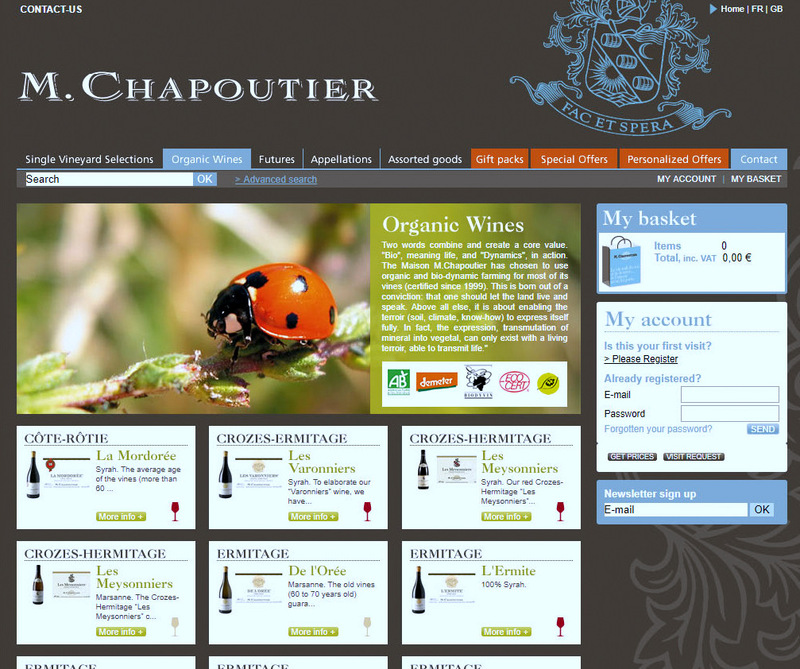 You'll see on the M.Chapoutier website, on their Organic Wines tab, there are five different labels, the fifth just being their own labels of organic and biodynamic. But there are four certifications that they hold and use. I've paraphrased the labels' significance. From the French Agricultural Ministry, this label indicates that wines come from organically grown grapes and have adhered to other organic farming specifications, including no use of chemical fertilizers, chemical weed killers or pesticides, or chemical fungicides. DEMETER is an international certification for products produced using biodynamic farming methods. Biodynamic parameters are much more rigorous than straight organic farming. Having been formally defined in the early 20th century, biodynamic winegrowers and winemakers aim to care for the planet and regenerate the soils by employing fertilizers and preparations based on medicinal and mineral plants, by respecting the rhythms of the Earth and the cosmos. The Biodyvin label indicates members of the Syndicat International des Vignerons en Culture Bio-Dynamique (International Union of Bio-Dynamic winemakers). The group strives to produce high quality wines, whose taste is representative of their region and terroir, while preserving the environment. Interestingly enough, this label is focused less on standardization and more on embracing differences and regional authenticity. ECOCERT is an inspection and certification organization overseen by the French public authorities and protected by legislation. It is certified by the Institut National de l’Origine et de la Qualité and certifies wines made from organically-grown (AB) or bio-dynamically grown (Demeter) grapes. Even with all of that, Gwendolyn and I have had an email exchange with Antonin Bonnet - who is in charge of exporting the wine to the Americas - to clarify. It sounds as if there are wines in their porfolio that are actually biodynamic, but they just haven't been certified as such. So, they don't bear the biodynamic label even though they are. It's exactly what Renee, my wine contact at Stone Creek Kitchen, suspected: the certifications are expensive, so many houses don't go through the process, even though they are in fact organic or biodynamic. But it certainly adds to consumer confusion. Camilla from Culinary Adventures with Camilla whips up Learning about Biodynamic Wines + M.Chapoutier Wines with Some Cross-Cultural Pairings. Jill from L’OCCASION shares Lessons From A Biodynamic Winemaker In France. Wendy at A Day in the Life on the Farm reminds us about Eating and Drinking Responsibly. 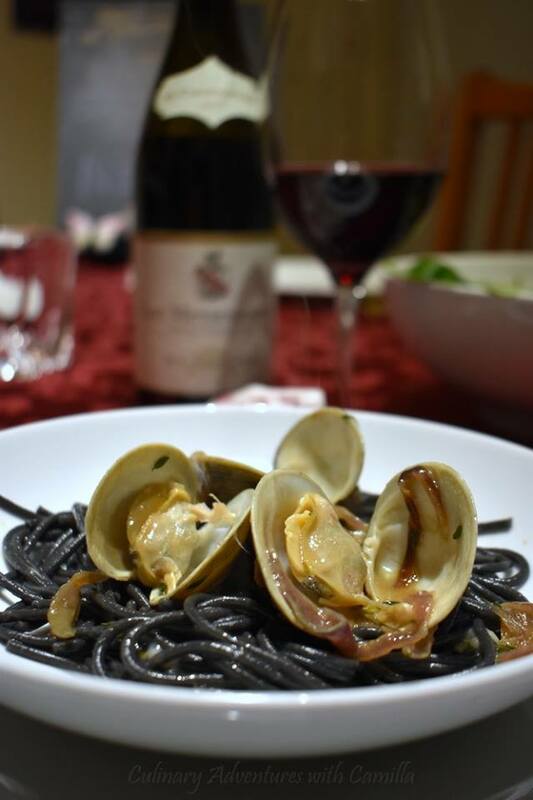 Deanna from Asian Test Kitchen tells us how French Biodynamic Wines get Crabby. Jeff from FoodWineClick! discusses Our Biodynamic French Friends. Kat from Bacchus Travel & Tours tells us how The #Winophiles Unlock the Mystery of Biodynamic Wines. Jane cooks things up at Always Ravenous and shares Why You Should Give Biodynamic Wines a Taste. Nicole from Somm's Table shares Cooking to the Wine: Marcel Lapierre Morgon with a Hearty White Bean Stew. Lynn from Savor the Harvest shares Biodynamic Bordeaux- Nobody’s Perfect But The Wine Is Fabulous. Susannah from Avvinare joins us with Biodynamic Cremant d’Alsace from Domaine Mittnacht Frères. Robin at Crushed Grape Chronicles entices us with Fabulous French Biodynamic Wines and some exquisite pairings. Host Gwendolyn on Wine Predator presents Still and Sparkling: 2 Biodynamic Wines from Alsace, 2 from Rhone for #Winophiles. It turns out I have already had poured - and shared - a few French biodynamic wines. A couple of months ago, for an Alsace event, in November 2108, I posted Lingcod, Legumes, and Domaine Mittnacht Frères Crémantd’Alsace. Domaine Mittnacht Frères is headed up by Christophe and Yuka Mittnacht. Christophe was a pioneer in the biodynamic movement and his house was one of the very first certified as biodynamic in all of Alsace. And further back in March 2018, I posted Sober Clams + a French Syrah when Maison M. Chapoutier sent me a few wines to try. The wine that I did pair for that is a biodynamic wine. Well, as we discovered from Antonin, it is biodynamic, but hasn't been certified as such. And for this event, I opted to pair two bottles of M. Chapoutier wine with non-French cuisines, both 2017 Belleruche Côtes-du-Rhône. Just one red and one white. The 2017 Belleruche Blanc is a zesty blend of Grenache Blanc, Roussanne, Viognier, Clairette and Bourboulenc. Tasting notes indicated aromas that hinted at ginger and summer stone fruits. The 'ginger' notes got me thinking about Asian food and I decided to poach some fish, including ahi tuna from my Real Good Fish CSF (community-supported fishery) and locally-caught salmon, in a miso-ginger broth. I served the fish with a side of rice and some spicy broccoli. The 2017 Belleruche Rouge is a blend of mainly Grenache with some Syrah. With its intense nose of pepper and fruit, I wanted an equally intense dish and decided to make shredded beef enchiladas. Recipes to come on both of these dishes. But feel free to play with Asian and Latin flavors and your French wines. You won't be disappointed! Next month the French Winophiles will be headed to Provence with Wendy from A Day in the Life on the Farm. And she has something a little different in store for us. Not only are we looking at wines from Provence, but some of us will be looking for inspiration by reading A Year in Provence by Peter Mayle. Because she has family who owns a used bookstore, Blue Vase Book Exchange is sponsoring the event and sending copies of that book to those of us who are interested. Count me in! I know that my CSA was the first "certified" organic in the area and she had a heck of a time meeting the qualifications and it was very expensive. She said that most small farmers and a lot of larger farmers practice organic farming but that they are not able to afford certification. She said your best bet is to attend local farmer's markets and talk to them personally. I imagine it is the same for those who farm grapes. What a lesson in learning and labeling. Your experience shows how communication with the consumer is important, and that it’s not always as easy as having the paperwork in order! Great wines and the meals look fantastic as always! I’m enjoying the robotics shares on FB. Cheers! Lots of good info here. It really can all get very confusing.